All transactions are safe and secure with a reliable history in online purchasing behind each of our associates. 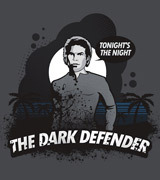 Buy the Dark Defender t-shirt to own Dexter clothing and merchandise. While most people would be upset by a new serial killer on the loose, some had a change of heart after seeing that the bodies were of killers themselves. The Bay Harbor Butcher, in some people's eyes, was doing a good deed. One of these people created a comic book character in his honor called The Dark Defender. Show your support with this Dark Defender Dexter t-shirt. It looks great under the Dexter bowling shirt and serial killer costumes. In addition to the Dark Defender tee above, browse the Dexter Clothing Gallery for more apparel like men's and women's clothes, kids shirts or hoodies.